With the start of the New Year, many families are revisiting budgets and spending habits. My family is no different. As we gathered to discuss 2016 finances, we noted that a HUGE portion of the 2015 budget went towards food. We eat clean, healthy, non processed, and organic. Can this be the reason for the monstrous size of the pie slice on the budget wheel? Is it really true that eating healthy is so expensive that only few can obtain it? Nutrition is the foundation of health and the basis for disease. Based on the Latest Medical Evidence on Organic vs Non-Organic Food , I wasn’t about to throw my hands in the air and call it a day. Over several weeks I investigated prices all around the town we live in, Charlotte, NC. My mission was to find out how organic food compares to non-organic food in 2016. Furthermore, I wanted to uncover ways to improvise my shopping and decrease my spending. Below you will find the price break down. I did not price out Whole Foods. Though a beautiful store, it has prices that are above the ones listed below. EarthFare is a local grocery store, similar to Whole Foods, with a lower price point. Publix has just opened its doors in Charlotte, but its prices were higher then Harris Teeter, our local standard Grocery Store. Walmart has a poor selection of organic fresh foods in our area. However, it has a large selection of organic pantry items on-line with free shipping over $50. Based on internet pricing, I found that Walmart carries a much higher selection of fresh organic foods in other cities. Target has an improved and impressive selection of organic foods, but it does vary by location within Charlotte. They also have an extensive online organic pantry selection that can be shipped for free with purchases over $25. Costco is a whole sale store in this area that has made impressive changes in their organic selections. Many shy away from Costco due to the membership fee. FYI, if you get the business membership, and you shop there regularly, you get money back at the end of the year, and the cash return pays for the subsequent yearly membership plus groceries. I reviewed Amazon prices as well, but you need to have Prime and there is a fee for shipping Pantry Items. ThriveMarket is an online grocery store. It has various organic pantry items that are cheaper then Amazon, Earth Fare, and Whole Foods, but not as inexpensive as Costco. Moreover, they have a membership annual fee. This is a great place if you specifically like an organic name brand product not found at Costco. Most people shop for the same groceries every week, generally. It becomes an ingrained habit for busy families. Most of us go to the same stores within our circle of errands, and we rarely deviate from the regular route. Few people think outside the box when it comes to food shopping. For instance, online grocery shopping from Target, Walmart, Costco is rarely considered. Though many plan their meals ahead of time, most folks come up with dinner last minute, which leads to running into a nearby store for quick purchases, which can end up being quite pricey. In 2016, the gap between Organic Foods and Non-Organic foods has shrunk significantly. It is no longer true that Organic is More Expensive then Non-Organic or that Unhealthy Eating is Cheaper. Remember the every time you buy an Organic Item, you are Voting for Organic. Due to increased demand, companies are listening, prices are changing, and product diversity is expanding. The prices are for the Cheapest Organic Product in its category. It was very difficult to find the same Name Brand item at all stores. Also, I am not sure how much it matters in most cases. I am leaving that to individual preference. Most stores have their own organic labels. If I am obsessed with one specific Name Brand, I listed it as the title. Green Highlighted items are the best price per oz. Dairy is Full Fat since I don’t recommend fat free or low fat items. The prices are for whole foods and not for snack items. Snack items that are organic can be as unhealthy as non-organic snack items. Label reading is a must, even if the package Claims Organic. Turn the box around and read the ingredients. As you may have noticed, there are some differences between non-organic and organic foods. However, for many items, the price is the same. In other instances organic is cheaper, and for the rest, the gap is much smaller then in previous years. 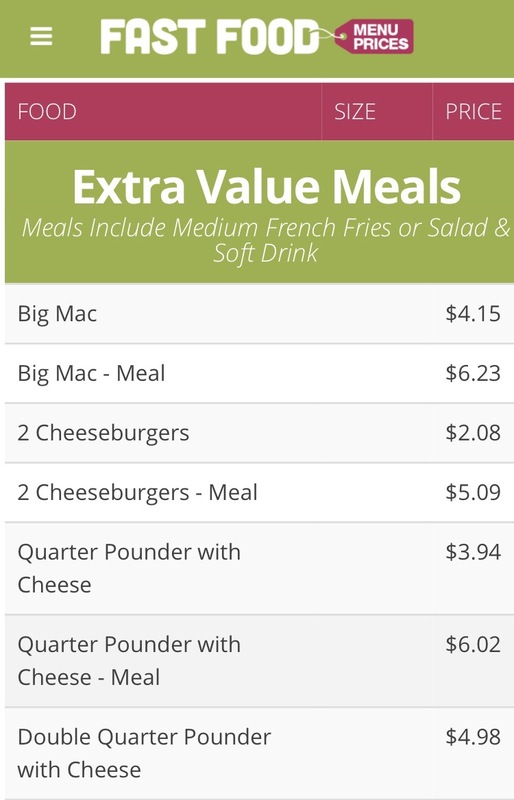 I always hear that the reason people eat at McDonalds is because it’s the cheapest way to feed the family. I hope this helps change your mind about healthy eating and food shopping. Many things have changed in the past several years as more people are becoming aware of the importance of food for health. You do not need to break the bank to eat healthy, you just have to shop with some planning and forethought. This is so awesome! Im sure it took you a while to compile and I appreciate the information so much! “Drop the mike” indeed. Aldi has a great selection of organic products now too. The produce selection is small but definitely cheaper! I am updating the list with BJ and Aldi. I had no idea. Thanks for letting me know. Will do an addendum soon. We as a family are slowly moving to more organic and cleaner foods. In the past year, I have stared to have issues with dairy so I tried alternatives for milk and I just couldn’t do anything but the real deal. The other stuff is yuck and the kids would never go for it either. We tried organic and the kids were fine I was not. So again, Dr. Axe suggested low pasteurized or raw milk. So I started with the vat pasteurized -low- and the kids loved it. They said it was so creamy and tasted like a melted milkshake that wasn’t sweet and it was good for my tummy so I was happy. Well today I tried the raw milk and the kids said it tasted the same to them but I felt better on the vat. So basically what are your thoughts on raw or vat pasteurized milk? Because you are a Pediatrician and a Doctor do you by law suggest to people to drink pasteurized homogenized milk because it’s safer? And technically it’s not Organic but the label on the bottle says grass fed blah blah for the vat and its from a dairy in NC. And the raw milk I bought at the Peach Stand in SC and that milk is from a dairy in SC also. But if it’s not labeled organic what do you think the possibility of it having had hormones or antibiotics??? And last question my children love whole milk. I have always tried to change them to 2% since they were little and they don’t think it tastes as good. They don’t do juices except not from concentrate OJ in the morning so do you think this is ok?? Thanks. Hey Jennifer – I agree with less pasteurized milk and so I use Homestyle Creamery. I talked to the farmer in NC and read up on the farmer in Virginia. The milk is organic but without the label of Organic due to cost. The cows are pasture raised and no antibiotics, etc. Everyone adores this milk. I do not recommend raw milk because of risk of listeria which is a bacterial infection. If you buy that milk, you have to boil it at home, which is pasteurization. Furthermore, I am 100% believer in whole milk and whole fat dairy. Low fat and fat free products are full of carbs and sugar. Jennifer – last thing, while on the organic path, I would change the daily OJ with either Non-Pasteurized (this is OK) or home made. This is a great way to get the kids to cook in the kitchen my making OJ. All the best. Love all the comments.